– How long have you been an artist? Since I was thirteen or so, so about sixteen years. – How long have you been producing palaeoart? I started with palaeontological art, so the same period. I’ve been through a few phases of eschewing paleontological stuff for “fine” art, but I’ve always come back. – What first got you interested in dinosaurs and art? I don’t really remember the initial spark, but it was enough to get a twelve year old me to read The Dinosaur Heresies by Bob Bakker, which really got me interesting in dinosaurs seriously. It made me feel like such a revolutionary, everything we knew was wrong! Man, was all that orthodoxy gonna get it when I grew up! About a year later Greg Paul’s article “The science and art of restoring the life appearance of dinosaurs and their relatives: a rigorous how-to guide” in Czerkas’ Dinosaurs Past and Present really got me interested in how dinosaurs (and their relatives) were depicted. His dinosaurs looked so strange and fascinating to a kid in 1992. Everything we knew was wrong (again)! In the mid to late 90s I had battles with the museum I was working at to put feathers on my theropods. I felt like a real hero of the Dinosaur Renaissance. 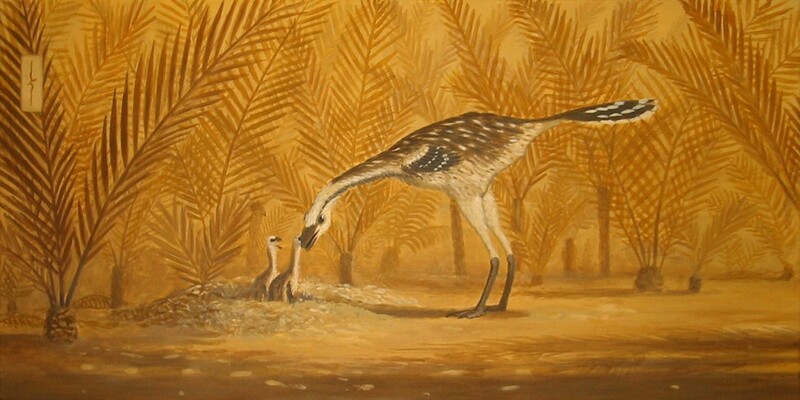 When they found the first feathered dinosaurs in China my head got so big I could scarcely walk for weeks. 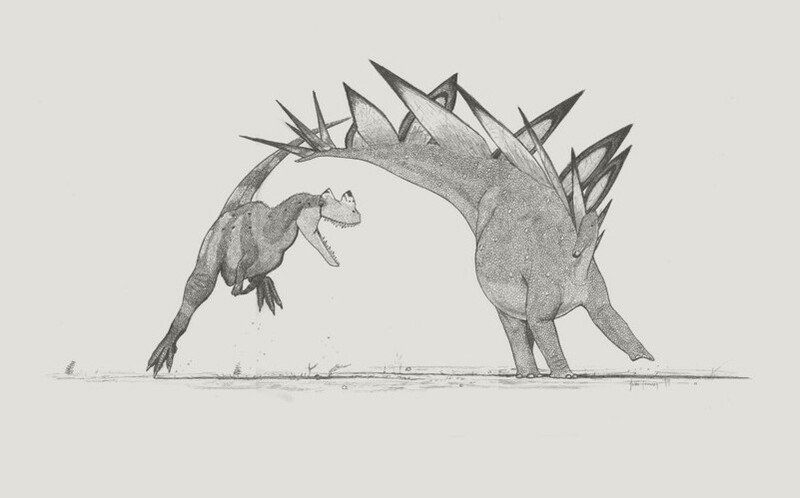 – What is your favourite piece of dinosaur art that you have produced? It’s a series of paintings done in Photoshop at successively smaller scales, then stitched together and animated in After Effects. I was looking for a way to get across the sheer breadth of scale in the fossil record, from dinosaurs to pollen in this case. I was also looking for a way to make picture of a biota without having to do a ‘menagerie’ painting, which is otherwise a necessary evil if you want to get a lot of animals in the one scene. I’m pretty happy with it, and plan to do a few more. I’ve also got other similar ideas in the pipeline. 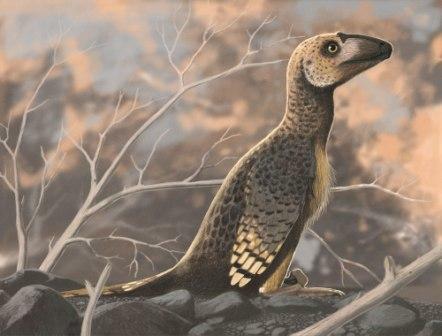 – Who is your favourite palaeoartist or piece of palaeoart? I have a few. Greg Paul is obviously huge. While a lot of people talk about is technical accuracy, I think his artistic style is fascinating. Look at painting like his Omeisaurus herd in a forest, it’s surreal, intricate, beautiful stuff. I think a lot of people imitate bits of Greg’s work, but most of them lack the visual distinctiveness that he has. I don’t think most of them even understand how distinctive it is. Doug Henderson is an extraordinary artist, I think I’d like his work even if it had nothing to do with prehistoric animals. Hall Train is the greatest palaeontological sculptor and technician there is. He has very little web presence, so a lot of people don’t know his work, but man, it’s the closest you’ll get to seeing a living dinosaur. He also thinks outside of the box, with new ways of doing old things, or perhaps that should be old ways of doing new things. An example of this is his clockwork walking Tyrannosaurus skeleton for the American Museum of Natural History. His stubborn refusal to have anything to do with computers hasn’t put him in a dark ages, it’s given his work a stunning ‘real’ sort of quality and lead him to break new ground. It’s inspired me to look beyond mere painting, but also given me the courage not to just jump on the 3D CG modelling/animation bandwagon. There’s new and exciting stuff to be done with an old medium. Among the younger generation, more my age, Bob Nicholls’ new work makes me jealous, and Julia Molnar’s work is superb scientific illustration. – What is your favourite dinosaur / archosaur? Classics like Diplodocus, Corythosaurus, Pterodactylus, Anhanguera and Velociraptor all float my boat. But I don’t have problems with the others! – Is there any animal you would like to paint but have not? Oh sure, heaps of things. 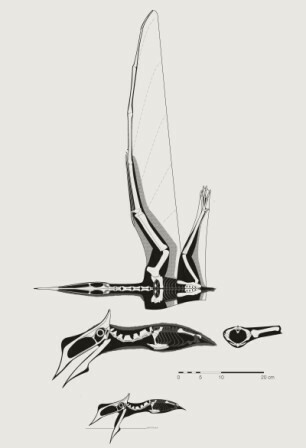 Just about every new dinosaur and pterosaur. I’d also like to branch out to include just about everything, but it’s difficult to familiarise yourself with _everything_ (it’s hard enough keeping up with dinosaurs and pterosaurs!). Mostly I want to be painting things which generally haven’t been reconstructed accurately, and really going to town on producing the most rigorous reconstruction I can. 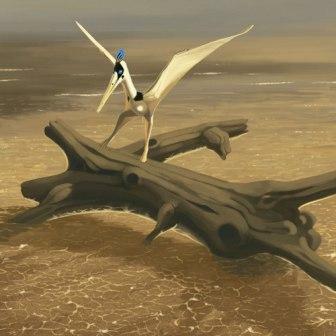 A few years ago, pterosaurs were in this state, which attracted me to them–the situation is much better now. – Oh yes, last question: What do you think is the most important part of good palaeoart?I expect people that know me will expect me to bang on about accuracy here, and I do think that a basic level of accuracy is a bare minimum. Many artists fail to reach this minimum, of course, and we can improve this situation quite a bit. But actually, I think an interesting artistic style is tremendously important. Greg Paul and Doug Henderson have it, but I don’t see a lot of young people now that interest me much artistically. 3D work has become very popular, but unfortunately it’s uniformly awful at the moment. I don’t want to end on a negative note like that, and actually, I’m quite positive about the future. It would be great if people interested in the appearance of extinct animals could communicate better; we need to be sharing our ideas and research into animal appearance more than we are now. If we do that (and I’m hopeful we will), we’ll be able to spend less time researching, and more time on the artistic side of things. Bloody hell Jon, the Jehol biota animation is great! Virtually seamless and takes you on a journey while getting the idea across clearly. A work like this really embodies the wonder of scientific discovery. Awesome site and can not wait to read more! If its OK, I would like to add you to my blog roll and recommended sites at my website/blog at http://www.njdino.com and maybe you can do the same for me. Hope all is well and best wishes!